The Accuweigh Adelaide branch recently supplied the necessary components and technical advice to allow a vineyard owner to manufacture his own portable weighbridge. 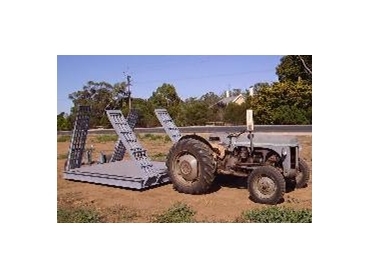 The client owns three different vineyards located 2-3 km apart and a portable weighbridge that could be easily moved using a tractor was a necessary requirement. Due to recently enacted Chain Of Responsibility Legislation; senders, carriers and receivers of goods transported by road can all be held responsible for overloaded trucks. To minimise their implication due to this legislation, wineries can reject deliveries of grapes from over loaded trucks. Vineyard owner, David Hender, from Langhorne Creek in South Australia fabricated the portable axle weighbridge to enable him to weigh every load of grapes before it is loaded into trucks for transport to the wineries. Accuweigh’s Tom Armour provided technical assistance and the necessary weighing components for the portable axle weighbridge such as load cells, junction box and the digital weight indicator. The end result was a portable axle weighbridge fitted with a towing hitch at the front and with removable wheels at the rear for mobility. Ramps are attached to the frame of the portable axle weighbridge to provide easy access for the grape gondolas and the ramps fold up for transport. This axle weighbridge is for non-trade use and only used as a guide to axle loadings and approximate truck weights.